B&N Offering $100 Discount On All Nook Models! It’s back to the school season and consumer electronic brands are trying to hard to offer the best deals. Barnes & Nobles is offering student discounts deal that aims to offer enticing discounts on Nook and other B&N products this season. The latest discount offers Nook consumers $100 worth of B&N pleasantries which includes ebooks purchasable from the B&N store. In simple terms, once you purchase a B&N Nook ebook reader, you get to download $100 worth of ebooks from the diverse collection available on B&N’s ebook libraries. To avail this offer, you need to register your Nook with B&N by 31st October following which B&N will issue an email notification that will allow you to download eBooks for free (presumably using the provided Nook Discount Code). More details on Nook discounts after the break. Jump . It’s free! The offer is valid for all the Nook eReaders including the first-generation Nook priced at $119, the all-new Nook Wi-Fi E-ink priced at $139 and the Nook Color Wi-Fi priced at $249. 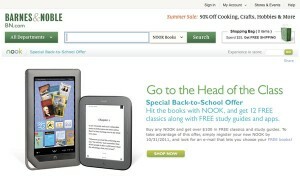 “Buy any NOOK and get over $100 in FREE classics and study guides. 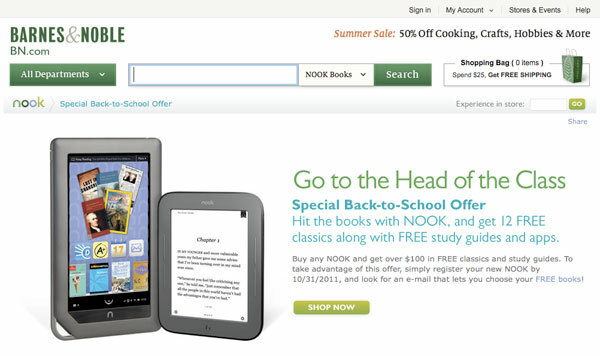 To take advantage of this offer, simply register your new NOOK by 10/31/2011, and look for an e-mail that lets you choose your FREE books!”, read the site. Nook is also offering up to 45% discount on several other products including journals, notebooks, back packs, laptop sleeves, drawing tools, and much more. Nook Color to become the Best Value Tablet! Next HP TouchPad Price down to $400!